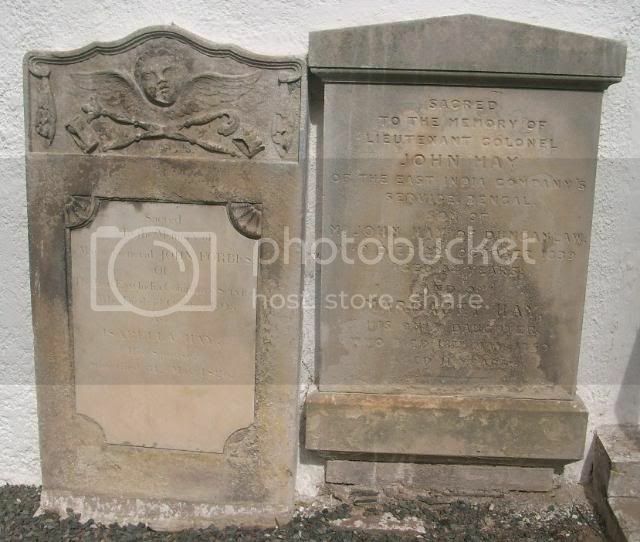 Additional information: Son of George Lloyd, and of Jane Forrest Lloyd, of Gifford, East Lothian. Grave/Memorial Reference: 19. B. 9. 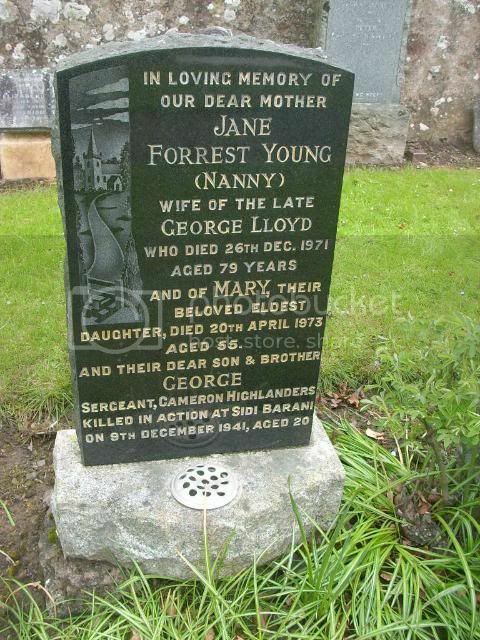 In loving memory of our dear mother Jane Forrest Young (Nanny) wife of the late George Lloyd who died 26th Dec 1971 aged 79 and of Mary their beloved eldest daughter died 20th april 1973 aged 55 and their son and brother George, Sergeant Cameron Highlanders killed in action at sidi Barani on 9th Dec 1941 aged 20. Please note the different year for date of death, CWGC have 1940, family stone have 1941. Sacred to the memory of Major General John Forbes of the Hon. 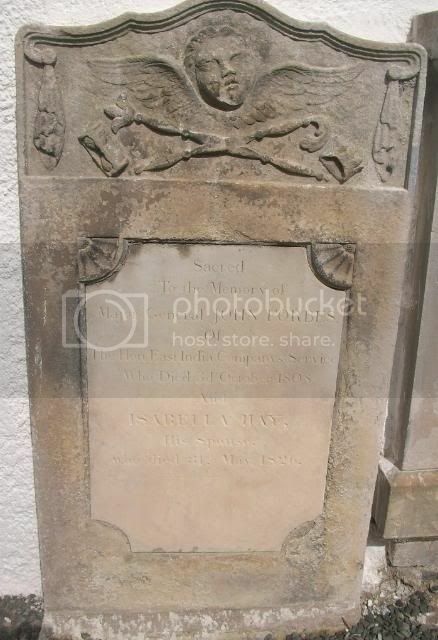 East India Company Service who died 3rd Oct 1808 and Isabella Hay his spouse who died 31st May 1826. 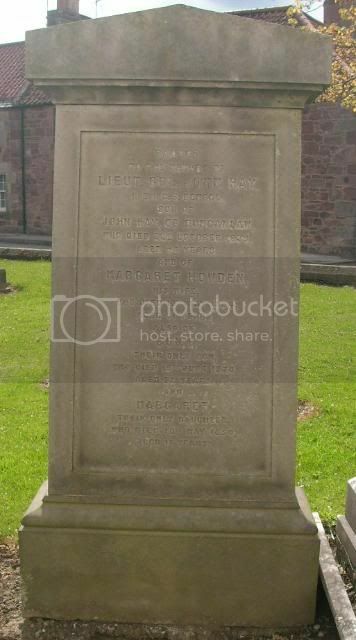 There appears to be 2 stones for Lt Colonel John Hay within the Churchyard. 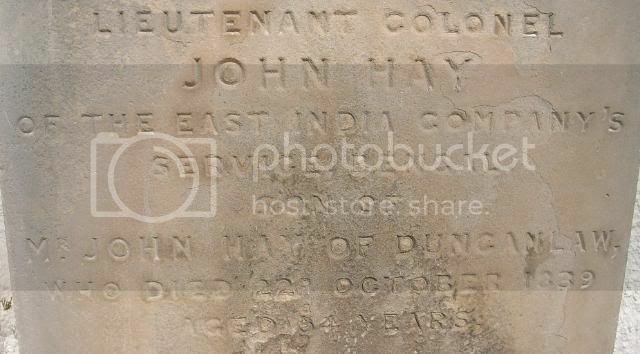 Sacred to the memory of Lt Colonel John Hay of the east India Company's service, Bengal, son of Mr John Hay of duncanlaw who died 22nd Oct 1839 aged 54 and of Margaret Hay his only daughter who died 18th May 1850 aged 11. 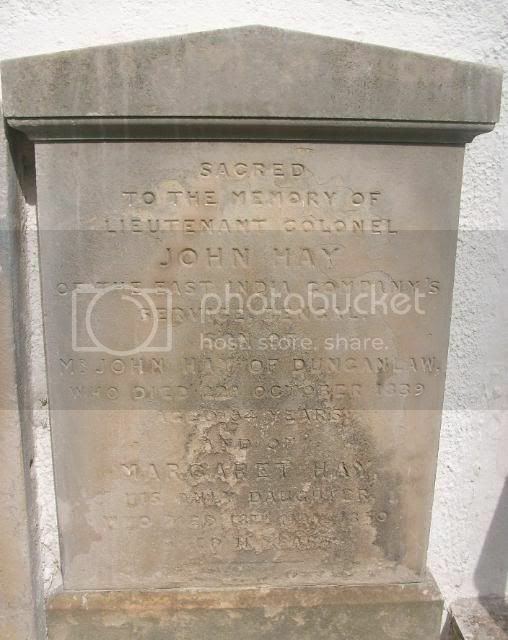 Sacred to the memory of Lieut Col John Hay H.E.I.C.S, Bengal, son of John Hay of Duncanlaw who died 22nd Oct 1839 aged 54 and of Margaret Howden his wife who died 19th May 1884 aged 61 also John thier only son who died 19th June 1870 aged 32 and Margaret their only daughter who died 18th May 1850 aged 11. 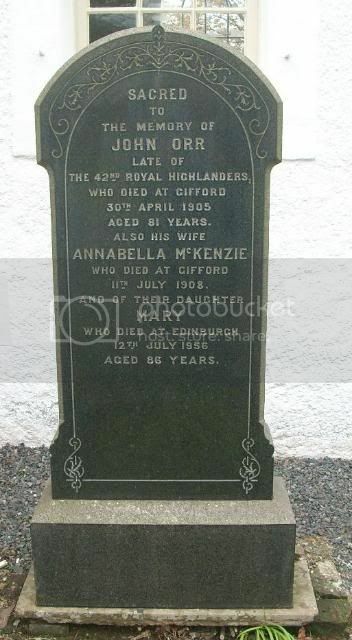 Sacred to the memory of John Orr late of the 42nd Royal highlanders who died at Gifford 30th April 1905 aged 81 also his wife Anabella McKenzie who died at Gifford 11th July 1908 and of their daughter Mary who died at Edinburgh 12th July 1956 aged 86. 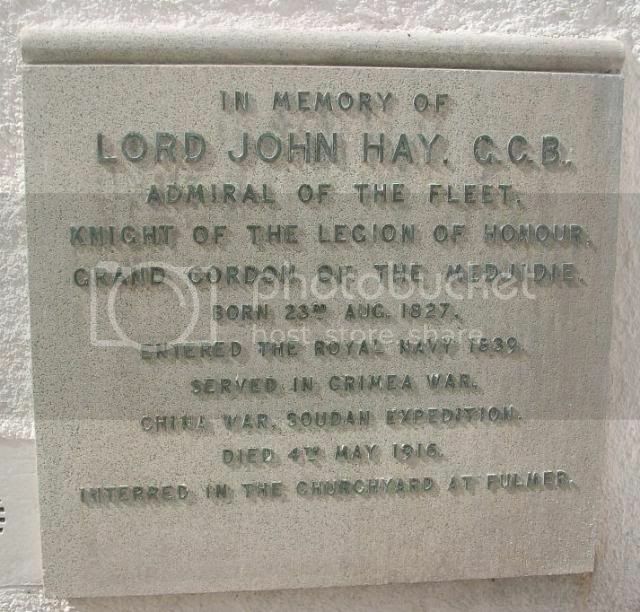 In memory of Lord John Hay G.C.B Admiral of the Fleet, Knight of the Legion of Honour, Grand Cordon of the Medjidie. 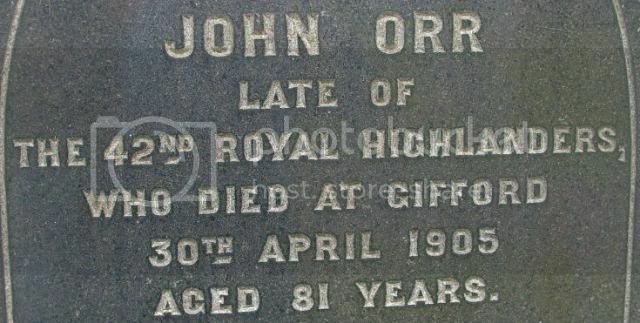 Born 23rd Aug 1827, Entered the Navy 1839, served in Crimea War, China war, Soudan Expedition, died 4th May 1916. 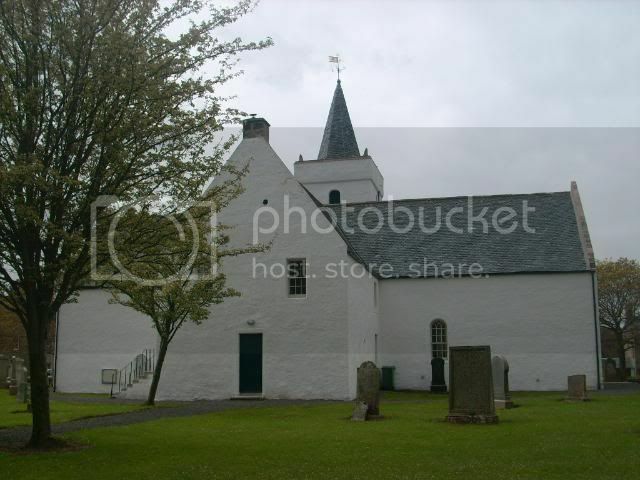 Interred in the Churchyard in Fulmer. 1839 - Entered the Navy (aged 12 years). 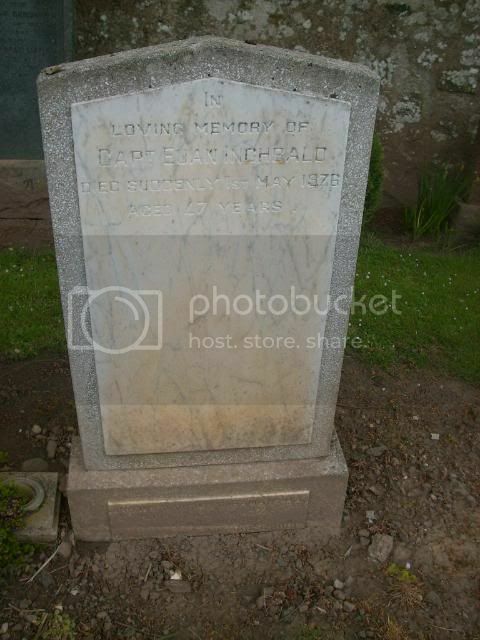 1871-7 May 1872 - Captain in "Hotspur"
In loving memory of Captain Euan Inchbald died suddenly 1st may 1976 aged 47. 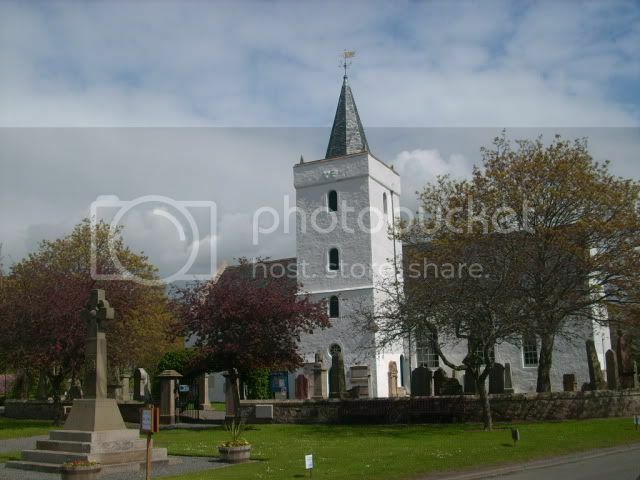 The Yester War Memorial is just outside the gates to the Church. In Greatful memory of those who died for us 1914-1918. However there seems to be a few who are mentioned on family stones in the Churchyard but are not on the Memorial. Perhaps they are on an other War memorial in the local area?